PIO believes that every child has the right to an education We believe that through education we can break the cycle of poverty and build a brighter future for the children of Cambodia. • Help children find their dreams: Many of the children on the garbage dump don’t have faith in the future. At school, Phymean and the teachers encourage the children to have dreams and to develop their interests. • Give children hope: By seeing the children’s progress and creating opportunities for them to display their talents, Phymean and the teachers show that the children’s situations can change. The People Improvement Organization (PIO) is a local NGO operating in Phnom Penh Cambodia. It was founded by Cambodian woman Phymean Noun in 2002, from that time it has continued to provide quality education and support to children and their families in Stung Meanchey , Borey Keila and Borey Santepheap 2. PIO is committed to providing quality education to children in need. Children attending PIO are:from families living in poverty, living in homes where they are at risk of harm or are of school age but who are not at school. The school is for children who are unlikely to complete their education unless they are helped and encouraged in their study. Children attending PIO are selected solely on the basis of their need. The schools welcome all children, regardless of gender, religion, ethnic group, or race. All PIO students receive school uniforms, school supplies, a daily meal, clean water and access to health care. There is no cost to either the child or their family. PIO supports students from Kindergarten through to University. The organization provides quality education from Kindergarten to High School for those most in need, PIO students receive all that is necessary to ensure that their education is complete and free. PIO operates under the approval of the Ministries of Youth, Education and Sport (MOEYS), Labor and Social Welfare. Attendance at PIO is entirely voluntary and yet the numbers increase every year. Families send their young children to PIO because it provides quality education at no cost. It is a school that cares about the children it educates. With an operating budget of $350 000 per year it costs PIO less than $1 per day to provide free education, school uniform and school supplies a daily meal, clean drinking water and basic health and dental care for 1300 students. PIO continues to change lives and give the children of the poor the hope of a brighter future. A number of children who once labored on the garbage dump are now at high school, university or have found employment. PIO continues to grow. It has the staff and resources to provide the education most needed in the communities it serves. Its leaders have a clear vision of how the lives of those born into poverty are changed through education. My name is Noun Phymean, I was born in the province of Kampong Cham in 1971. In April 1975 The Khmer Rouge took control of the whole country. It was a time of darkness and despair. In four years the Khmer Rouge destroyed everything, there were no longer any schools, hospitals, pagodas or even money. Those of us who lived through that time were made to work in the fields with only small amounts of food to survive on. We were hungry all the time. Even after the Khmer Rouge were defeated there was still a lot of fighting. My country had been destroyed and we all had to begin again. There was no one to help us. We had to be strong and work together just to live. Two million people died. I, survived, along with my parents and sister but many of my extended family were killed. The most important person in my life was my mother. She was a kind, strong and intelligent woman who had a huge influence on my life. Sadly she died from cancer when I was in my early teens. She taught me many things but the lesson I remember most from her were these. These were very wise and powerful words. To this day they still inspire me and motivate me in my work helping the poor children of my country. 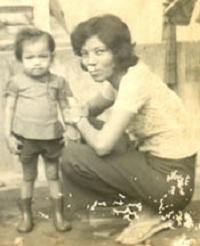 With the death of my mother I was on my own, having to survive in in dangerous and difficult times. I also had the responsibility of caring for my niece who was only two years old. I knew that we had to support ourselves and that I also needed to finish my education. Without an education I knew there was no hope for a better life..I got a part time job, as an office assistant. That let me earn a small amount of money while I was a student. It provided me with enough money for food and for school fees. Later I got my degree and I knew my mother was right. - Education is the key to a better life. By the end of the 1990’s things were better. Cambodia was more peaceful and I had a good job working for the United Nations and later the International Labor Organization. It was then that something happened which changed my life and motivated me to fight for the rights of children. Especially their right to an education. I knew that in Cambodia there were many young children who did not go to school because they had to work to earn money so their families could survive - but I saw the reality one day when I was eating lunch with a friend. I had finished eating lunch with a friend. When I threw the chicken bones away a group of children grabbed the bones and gnawed on them to extract some nutrition. I was horrified. I bought lunch for the children and talked with them. They told me that they worked as garbage pickers. When I asked them what they wanted to in their life they all told me that they wanted to go to school. That night, as I thought about the children I could not sleep - it was then that I decided to build a school for them. The school started in 2002 on the Phnom Penh garbage dump . The children wanted to learn but the only place they could learn was at the place where they worked. It was very hard. It was dirty, smelly and dangerous but it was where they lived, and where they would go to school. I started with 20 children and one small classroom. More and more children wanted to attend the school and the numbers grew and grew. The children wanted to learn. so we taught them English and subjects in the Cambodian school curriculum.In 2004, with the help of Jessica Newman from Just World International I was able to provide the children with a daily meal and rice for their families. Today PIO has grown into a large school with classes from Kindergarten through high school, they receive a good education and the very real hope of a brighter future. I am so thankful to all my family and to the many supporters visitors, sponsors, and volunteers from all over the world who have shared my vision of helping the children of Cambodia and I know that with their continued love and support PIO will continue to support children gain that most valuable asset - a good education. In my life and work I have learned that even when the worst things happen we can be strong and fight for what we believe in.. That we all need to help one another and work together to make our world a better place for everyone. There is always hope for a better future.and that people with a have a good heart and a passion for what they believe in any of us can make a lasting difference to the lives of those less fortunate. Education is the key to change the world. © Copyright 2017 People Improvement Organization(PIO). All Rights Reserved.